This year has seen a number of Members of the European Parliament (MEPs) getting into trouble over the use of their expenses. Former MEP Peter Skinner was sentenced to a four-year jail sentence for fraudulently claiming about €120,000 over five years, which was used to pay for, among other things, alimony and a classic car. Unfortunately, this was not an isolated case. 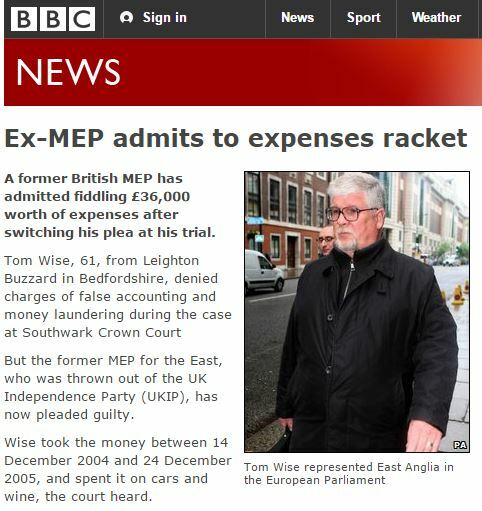 Tom Wise, a former UKIP MEP, was sentenced to two years in prison after spending thousands of his office allowance on crates of vintage wines and personal credit card bills. And the Front National delegation of Marine Le Pen in the European Parliament has been referred to OLAF (the European Union Anti-Fraud Office) for possible fraud involving staff allowances. Just under €40 million a year is spent on MEPs’ offices expenses, which amounts to €4320 per month per MEP. This money, known as the General Expenditure Allowance (GEA), goes, by default, directly into MEPs’ personal bank accounts each month, meaning that no one can check how they spend this money. With this lack of scrutiny, it is no surprise that there have been some issues with expense usage. The lack of oversight afforded to this sum of money is unique. It is hard to imagine MEPs agreeing to a €40 million annual payment of EU funds without an ounce of financial scrutiny, in any other context. Yet, year after year, this is exactly what happens with their own expenses. Could this be the year that real progress is made for transparency and accountability of how MEPs spend their €40 million a year in office expenses? There are glimmers of hope. Despite the Secretary General’s reluctance, in the most recent Parliamentary discharge report, MEPs themselves have now called for both greater transparency and the need to urgently audit the GEA. Some MEPs have already decided to fill the accountability shortfall. For example, domestic MP expenses scandals in the UK prompted both the Conservatives and Labour delegations in the European Parliament to have their general EU expenses audited since 2011. There is growing external pressure to change the expenses system. In 2015, Journalists from all 28 EU Member States brought a case to the European Court of Justice against the European Parliament for their refusal to release documents relating to MEPs’ expenses, including the General Expenditure Allowance. Transparency International EU strongly supports this initiative and has submitted its own access to documents request for information on MEP allowances, which was denied. In response to our appeal, Ildikó Gáll-Pelcz, MEP, the Vice-President of the European Parliament, in charge of responding to access to documents requests, unwittingly highlighted the contradiction in the current framework. First, she states that the European Parliament does not have any documents concerning the details of how the €40 million is spent. Then she states: “I would like to underline that the use of allowances allocated to MEPs is subject to stringent rules and comprehensive control mechanisms.” However, in the case of the GEA, this is not true. It is time for the Parliament to put in place robust transparency and accountability rules on how MEPs spend public money. This is not something that only transparency and open-data activists want. We asked MEPs themselves if they wanted greater oversight of budgets and on what and how EU money is spent and they overwhelming said yes. So we are asking MEPs now to embrace this desire for oversight and transparency and enact it for their own budget lines. Transparency International EU believes that the best way to ensure that public money is used properly is through transparency. That is why we are working on a project called openbudgets.eu. This will serve as a one-stop-shop for EU budget data, so that citizens, journalists and civil society can check how taxpayers’ money is being spent. We believe the public should be able to scrutinise how MEPs spend their expenses. It would mean an MEP will be less likely to get away with using his or her expenditure allowance on buying a classic car. But it would also mean that MEPs would be able to see where a sizeable amount of EU operational costs are spent, and help it to be spent more effectively. If MEPs’ expenses were available online on a platform like openbudgets.eu, it would act not just as a deterrent to wrongdoing but also as an incentive for expenses to be spent efficiently.